Accepting 10” x 12” body armor, the Veritas™ Plate Carrier features a minimalistic profile without sacrificing real-estate and is smaller, but more modular, than its larger kin the Testudo™. Intense care was given to material choice in effort to forge a comfortable, ventilated, and lightweight plate carrier. Durable 3D mesh lines both the inner plate pockets with inlayed soft loop Velcro pontoon attachment points. removable mesh padded shoulder pads are included, each featuring tri-loop guides and attachment points. 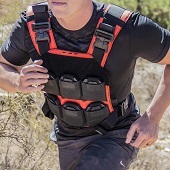 The low-profile emergency drag handle traverses through the entire back half of the plate carrier for increased strength. Broad 2” side buckles secure the adjustable straps, and are user removable for increased comfort when running the Veritas™ cummerbund. The Veritas™ Plate Carrier is a modular system and will launch with an optional array of excellent accessories, and more to follow! Please Note: This carrier does NOT fit our 10" x 12" Square Back Plate.